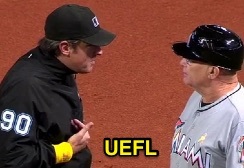 1B Umpire Mark Ripperger ejected Marlins 1B Coach Perry Hill for arguing a check swing (ball four) call by 3B Umpire Andy Fletcher which occurred in the bottom of the 1st inning of the Marlins-Indians game [Hill's ejection occurred in the top of the 9th inning]. In the 1st, with none out and one on, Indians batter Jason Kipnis attempted to check his swing on a 3-2 fastball from Marlins pitcher Andrew Cashner, ruled "no swing" by U3 Fletcher on appeal from HP Umpire Nic Lentz. * Ruling was reviewed and deferred by the UEFL Appeals Board (0-3-5), the call was irrecusable. At the time of the ejection, the Indians were leading, 6-2. The Indians ultimately won the contest, 6-2. This is Mark Ripperger (90)'s third ejection of the 2016 MLB regular season. Mark Ripperger now has 7 points in UEFL Standings (5 Previous + 2 MLB + 0 Irrecusable = 7). *Reason for ejection was surmised from Mattingly's post-game comments to reporters. This is the 148th ejection report of the 2016 regular season. This is Miami's 7th ejection of 2016, T-1st in the NL East (ATL, MIA 7; NYM 5; WAS 4; PHI 1). This is Perry Hill's first ejection since June 9, 2009 (Doug Eddings; QOC = Y [Out/Safe]). This is Mark Ripperger's first ejection since June 7, 2016 (Chip Hale; QOC = Y [HBP/Foul]). Wrap: Miami Marlins vs. Cincinnati Reds, 9/2/16 | Video available via "Read more"